Looking for something unusual, a unique evergreen that turns, relatively quickly, into a botanical waterfall? A bullying, spreading, weeping tree that rules the roost in winter? A tree your neighbors don’t have, unless you live in Seattle or Portland? Got just the thing for ya. Assuming you have a large enough space to place it. 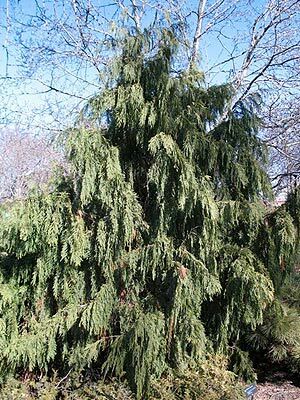 C. nootkatensis ‘Pendula’ is a stately, weeping evergreen with drooping, upward-curving branches and vertical, flattened sprays of bluish green to dark green foliage. It produces both male and female, brownish-green cones in great abundance and to great aesthetic effect. C. nootkatensis is native from Alaska to northern California, most often found in the cool, moist wooded areas of the Pacific Northwest, though the tree is also found on the upper East Coast. In the wild, in a perfect spot (moist bottomlands, alongside a stream) the tree will grow slowly to a height of ninety feet, and can live for one-thousand years. ‘Pendula’, the weeping form, is a fluke form discovered in the wild. The nursery industry has taken an interest in the plant for several decades at least, meaning it can be found in the trade across the Midwest and the Northern states. This weeping form of C. nootkatensis generally tops out at thirty-five feet, though in the Pacific Northwest you might get one to forty-five feet. The plant is hardy to Zone 4, with a growing range of Zones 4-7. You need only one. Plant this tree with an eye toward mature size – thirty to forty feet tall with a spread of around fifteen feet in zone 4, twenty feet in zone 5, and upwards to thirty feet in zones 6 and 7. Of course, you can prune it to control width. Plants prefer average, well-drained soils and medium moisture. Even a mature specimen will appreciate regular watering during heat of summer. Plants will tolerate alkaline soils but thrive in neutral to slightly acidic soils. Plants prefer full sun in Zones 4 and 5, but appreciate some afternoon shade in Zones 6 and 7. If planted in a hot Zone 6/7, such as Kentucky or Arkansas, you definitely want some afternoon shade. Always plant where it will not be beaten up by drying southwesterly winds in summer or northwest winds in winter (northern zones). It’s a terrific front or back yard tree, anywhere it can be seen in its entirety.